Regarding my electric fireplaces, I furnished my home with them for several reasons. -These portable fireplaces, although functional heaters, are mainly decorative for my purposes. I wouldn't have it any other way, because I very much need the look of a real home for this type of house. Since I do not own my home, I instead own the things that make it a home: the chandeliers are mine, as well as any architectural embellishments. -The house I live in does not have a built-in fireplace and there is no possibility of adding one. -The electric fireplaces supply a good decor item that gives the house a warm, lived-in look. -Electric fireplaces are portable, which makes it easy to heat up any part of any room, or rearrange the furniture. "Real fireplaces" have to stay in the same location, but a portable one makes rearranging the room more interesting, at least, to me. -It is not necessary to use the heater and run your electric bill up. You can just use the light to light up the fireplace. -They can be used in the summer, since you don't have to turn the heater on, only the lights. If you are planning on getting something like these, I would advise against any of them with the darkened glass because the fire in it does not shine as brightly. Instead of this one, above, get this one, below. I did not know about this until I received the white fireplace and discovered the darkened glass. The only time the flames show through the darkened glass is when the room is completely dark. So if you are in Walmart looking at the variety of electric fireplaces, get someone to take it out of the box and let you look at the glass, if you can. If not, Most of them are clear glass. The brown one, above, has an optional hinged leaf in the back whereby you may make it into a corner fireplace. Corners are great places for these units, and give the room a different shape. All of my fireplaces came from Walmart.com and were delivered to the door. However , they are available in the stores and can easily fit in a car, as far as I know. I particularly like the little black stove with the flame and the heater. 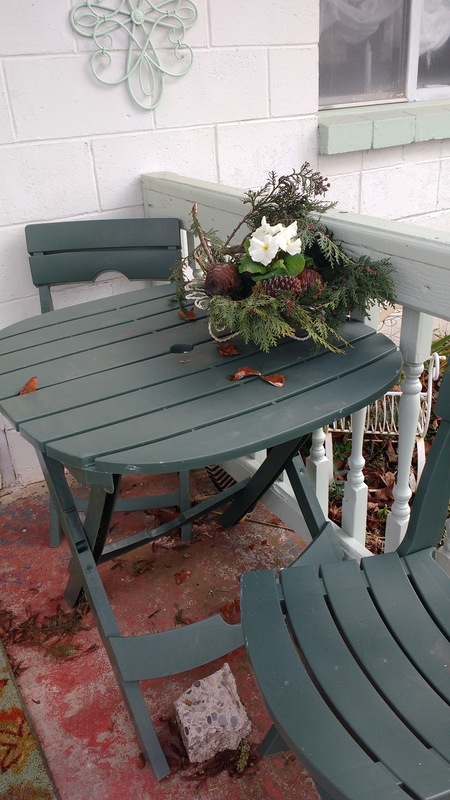 It fits so nicely in small rooms and tiny corners and can be put in the most unusual places--a hallway, a bathroom, an inside porch, the sewing room. 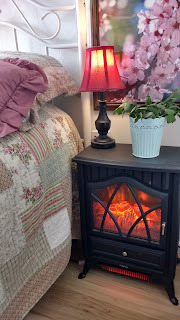 It is being used as a bedside table here, and in the living room next to Mother's chair it makes a nice table for a reading lamp and her books. The larger fireplaces look great in bedrooms, living rooms and dining rooms. I have three altogether. 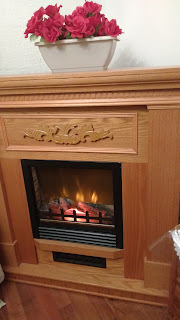 Our main source of heat is propane, which we like very much, and the electric fireplaces are just supplemental, to take off the chill for 5 minutes or so in the mornings or now and then. Otherwise I use the lights in them that make the fire flicker as though it was really burning. 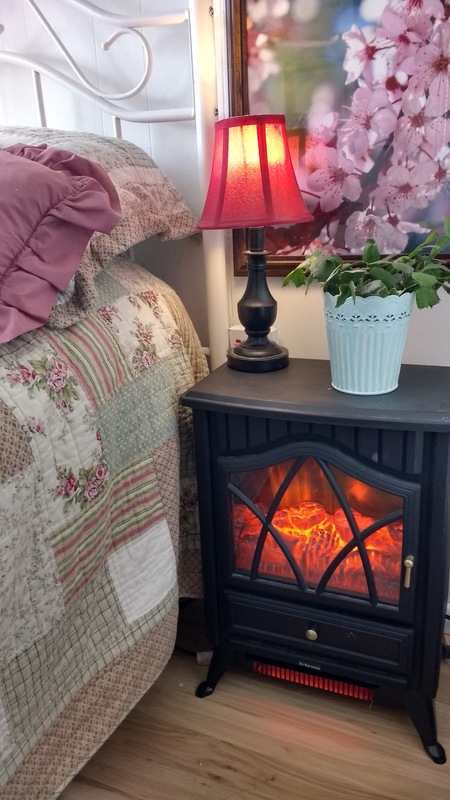 I would not recommend the portable electric fireplace as a main supply of heat, but it helps warm up a cold bedroom and looks ever so nice in a guest room. Inside, I enjoy using the electric fireplace as another piece of furniture that can be used in other ways. The mantel makes a nice book shelf or place for framed family photographs, a big bouquet or anything that suits your creative thinking. ...and add a few pieces of real wood , which smells great. I'm using artificial wood, made with styrofoam and bark. You may remember I made a fake cake using bark, and this is the same kind of craft. If I ever get time, I'll show you how to make one of these logs. If you are ordering one on Walmart.com read the description and make sure it is fully assembled. They are "a bear" to put together but the recent models are fully intact. The stores also have them, in one unit, and the box fits in the car. The portable fireplace also, in my opinion, provides a little elegance to even the poorest of rooms! If you do decide to get one of these portable heaters, make sure it is completely assembled right in the box so that all you have to do is slide it out and plug it in. In years gone by when these first came on the market, you had to put them together, and what a job that was. 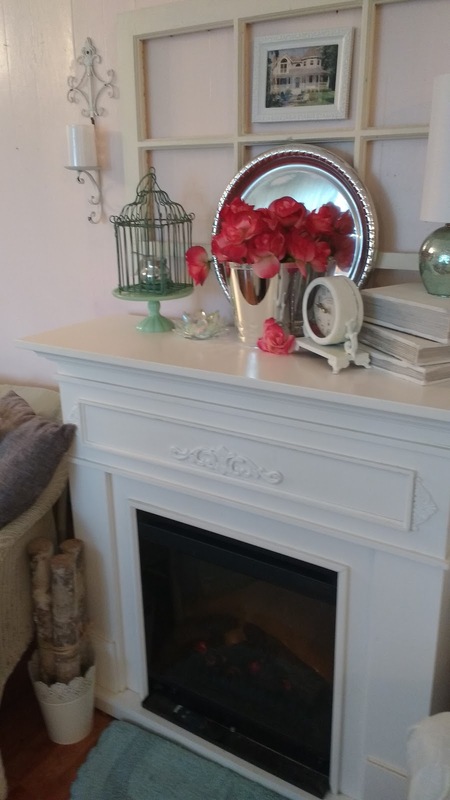 Your fireplaces are all quite lovely and really add a nice touch to your decor. I feel inspired now to think of where I might be able to fit one of these into my house. Our house is very cramped, but maybe if I rearranged the furniture I might figure a way to fit at least one of those little ones in somewhere. 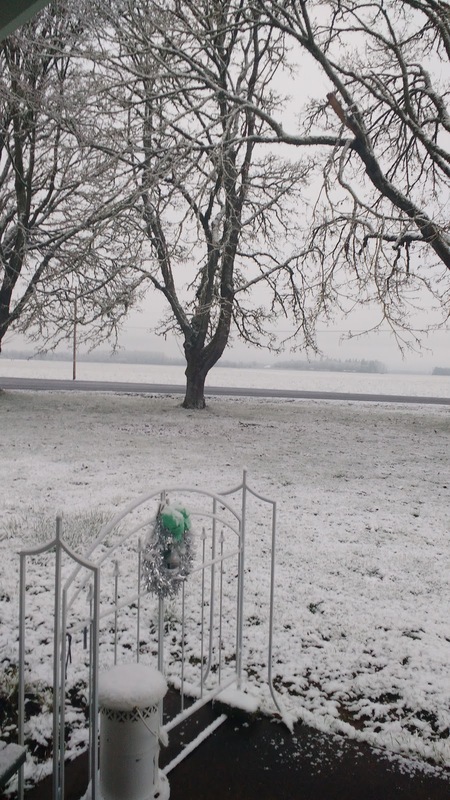 Our old farmhouse is very cold and drafty, and the heat would be a nice bonus. Laura Jeanne, You'll find space when you double the use of it as an end table (the black one). It looks great in a kitchen and fits well under the kitchen table so that it still shows but is out of the way. Start with one of those small ones and move it around til it looks good. They also have a leaf connected by a hinge, that is triangle shape when you want to move the larger ones into a corner. Thank you for this blog post. I enjoyed seeing all the ways you have used these "heaters". Sometimes on very cold and dreary days I just need a heat source I can stand next to or sit in front of to warm my bones. Sometimes I just enjoy the ambiance of the "flames". My heater does have a thermostat so the heat will kick off but the flame effect stays on. I also appreciate the extra table top space for displaying decorative items since the top of the unit never gets warm/hot. I think the little black fireplace is just adorable. You are so clever to use it as a bedside table. We have an electric fireplace that we bought at Home Depot a few years ago that has two narrow compartments with doors on each side of the "fire" that we store our dvds in. I love anything that will give me extra storage. My SiL has one that is not electric that uses Sterno to give the effect of a real fire among the ceramic? logs. I own the little black one and I also have a medium sized one that is in my living room. The small black one is in my bedroom. We don't use them as a heat source, but I do enjoy the ambiance of a "fire" on a cold winter evening with soft 40s instrumental music coming from my "40s" era radio (it doesn't actually work, but a small bluetooth speaker that sits behind it works well with my phone's playlist to give the illusion of music coming from the radio) with a good book and a cup of coffee or tea. It does make a house a home. Have a great day. Your fireplaces are very beautiful! I also have a white one in our SW Florida beach style home. You don't see many fireplaces down here, as our winter days are usually warm. However, on the occasional cooler day, the fireplace functions very nicely as a heater, since heat down here costs so much to use. It also makes Christmas feel more like Christmas. 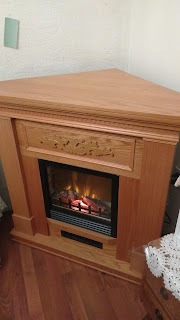 I gave an oak style fireplace, similar to yours, to my daughter for her home. She placed a beautiful painting above the mantle, and it transformed her little place, adding beauty and warmth. I'm embarrassed to say that I use mine for a tv stand, since I do not have room for one otherwise. (Although, it would be more fun to decorate the mantel!) I also love the bookcase additions you sometimes see attached to the sides of these fireplaces. If you look, you can find good deals on these. Mine was in the $300 range online, and it's a good sized fireplace. They can be delivered right to your door, often for free. Your pretend logs look so real! Very good job! Julie...you don't happen to live in Naples, do you? If so, I lived there in the 50's and my grandparents lived there til 1985...when they had passed on. 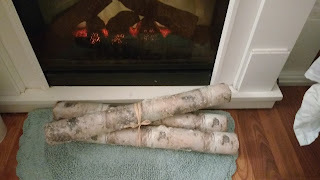 I love this post on your portable fireplaces! I love the ambience of a fire on cool days and evenings. 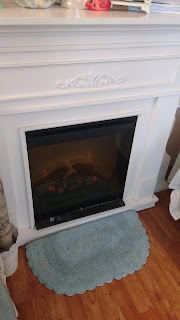 We have two "real" fireplaces which can be a bit of a chore to use and clean up after. But it would be so nice to have a portable electric one that I could use more easily. Thanks for sharing. I remember reading about Mennonites making these as well with beautiful carvings on them. They could be moved around the room as well since it was on rollers. Pretty cool I thought. 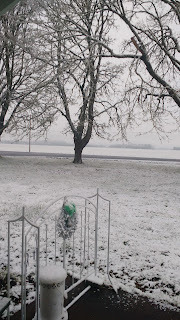 We had a bit of snow flurries today when I went out today. Caught me totally by surprise! I have an electric fireplace, but sadly it stopped working, and I had to get a new heater, nowadays, I mainly use it for extra book storage. When previewing my comment before sending this one, I saw that my profile picture was missing....I guess that's why my comments (2) were by 'unknown'. 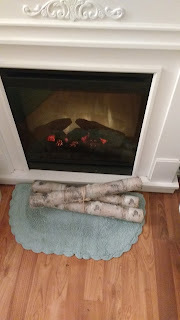 We have a real fireplace, and even though we live in Southern CA, it gets used. I was at the store on Friday and bought some real wood and we used it last night. I can turn my thermostat down and the room stays warm. We usually use firelogs and have to watch the news to see if it's a no burn day or not. The fireplace was surrounded with black tile by the previous occupants. It makes the room so dark. I love to have a fire going and sit out there with a book. It's pouring rain here with the wind whistling between the homes. I have an electric fireplace in our living room. I don't see a change with our electric bill when I use it. I too find them very pretty in a home.